Yesterday I hiked solo to explore a stretch of the Bonnevile Shoreline Trail in Draper. 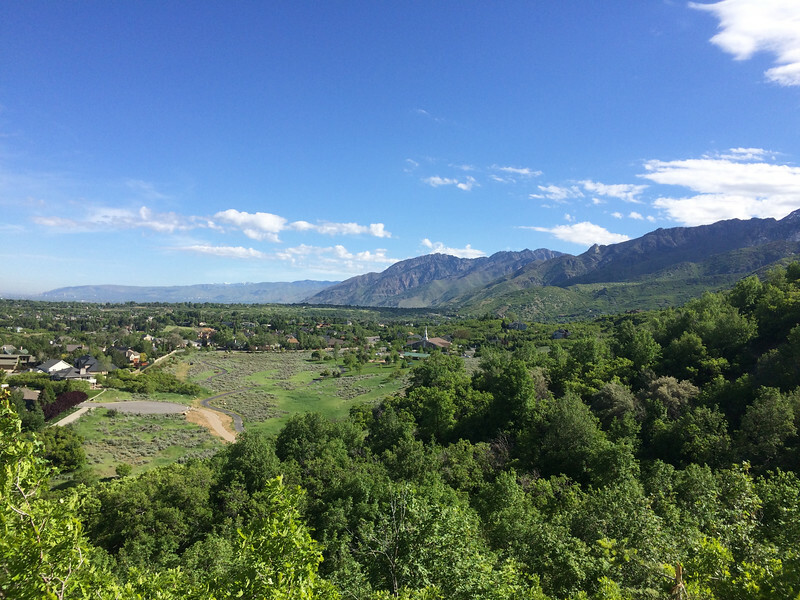 I started at Hidden Valley Park in south Sandy and hiked to the Bear Canyon Suspension Bridge in Draper. My oldest son and I have explored this trail a couple of times before, but his boredom meant we never got very far. 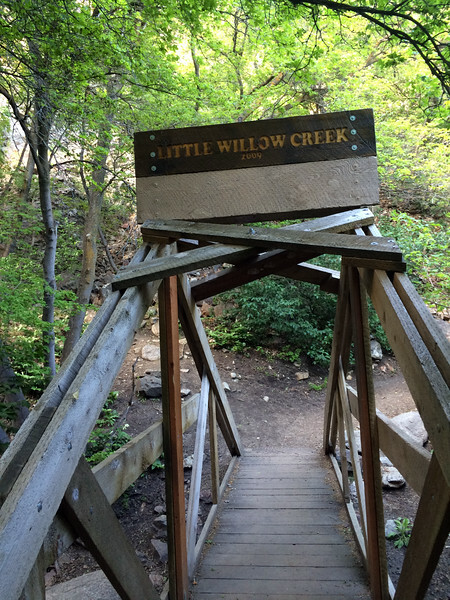 We explored around Willow Creek Canyon and the next canyon over, but that’s it. We’ve seen the suspension bridge from a distance when driving and my oldest and I have talked about hiking to it. But motivation for him has been a struggle. I have wanted to lead a Hike it Baby hike along this part of the BST, so I set out to explore a bit and see how far the bridge was from the park we frequent. 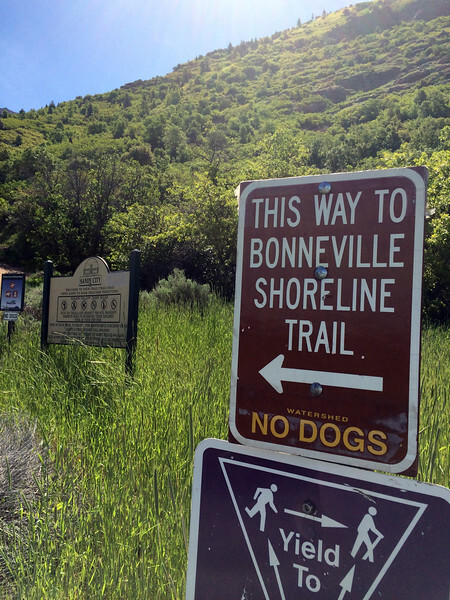 What’s the Bonneville Shoreline Trail? 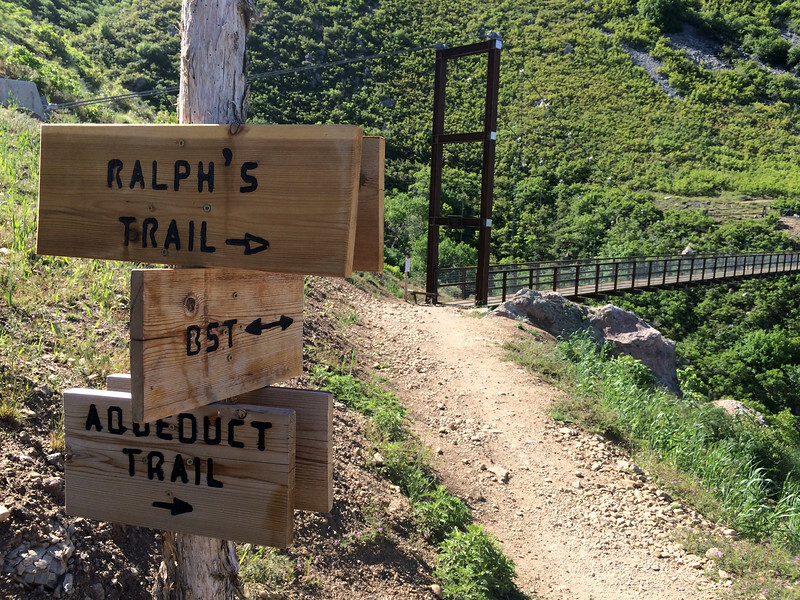 The BST is a trail that, when completed, will stretch from the Idaho border to Nephi, over 220 miles, and will span six counties. It skirts along the edges of the mountains of what was once Lake Bonneville: and ancient, pluvial lake that covered the majority of the Salt Lake Valley approximately 17,000 years ago. The Great Salt Lake is all that remains of the ancient lake. There are still large portions of the BST that aren’t completed, so it’s not a thru trail just yet. But hopefully it will be in coming years. 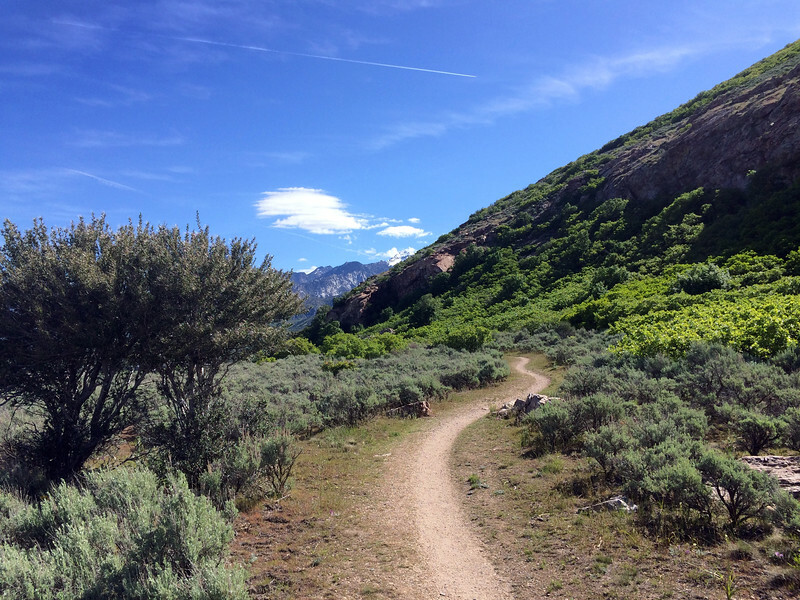 It’s a popular trail for hikers and for mountain biking. Matthew and I headed out early enough in the morning that a good portion of the trail was shaded by the mountain. It made for a beautiful morning! We took a quick break at the wooden bridge in Willow Creek Canyon so I could shed my sweatshirt and Matthew could throw rocks off the bridge. There wasn’t any water flowing under the bridge, but I think that was on purpose since there’s some sort of pump contraption higher up the canyon. 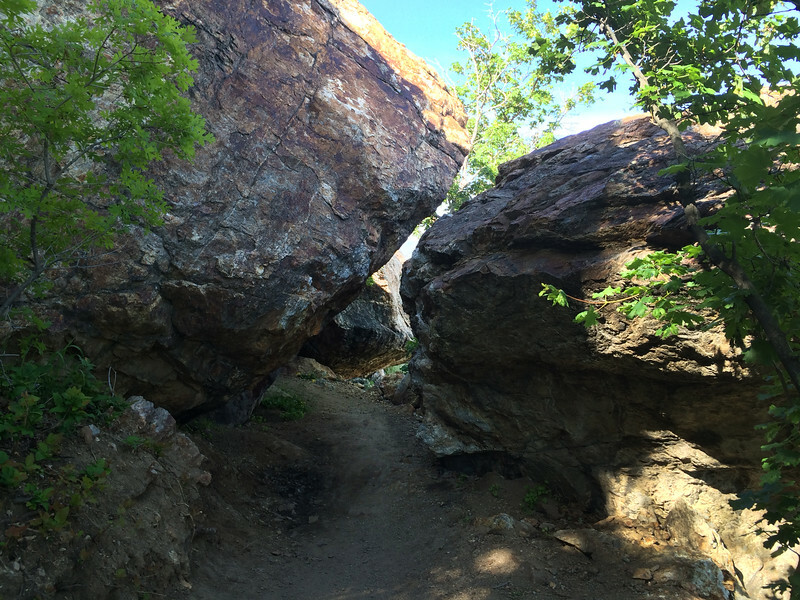 When Tommy and I last hiked into this canyon last summer, it was accessed by climbing down large boulders. Those have since been replaced by large stairs made from railroad ties. Safer for hikers and bicyclists too. Once I got out of Willow Creek Canyon, I upped my speed and set a good pace toward the next smaller canyon. This photo shows the view looking back toward where I started. My car is parked just to the left of the church in the distance and you can see the paved path that meanders around Hidden Valley Park. At one point the trail split and I wasn’t sure which way to go. To the left led us to some boulders that had formed a small tunnel. It looked like fun so we went that way. Matthew thought it was fun to duck under the rocks. And it turned out the path to the right just veered around the boulders. Made sense as mountain bikers wouldn’t have been able to ride under the rocks. The trail widened a bit and we were more out in the open. 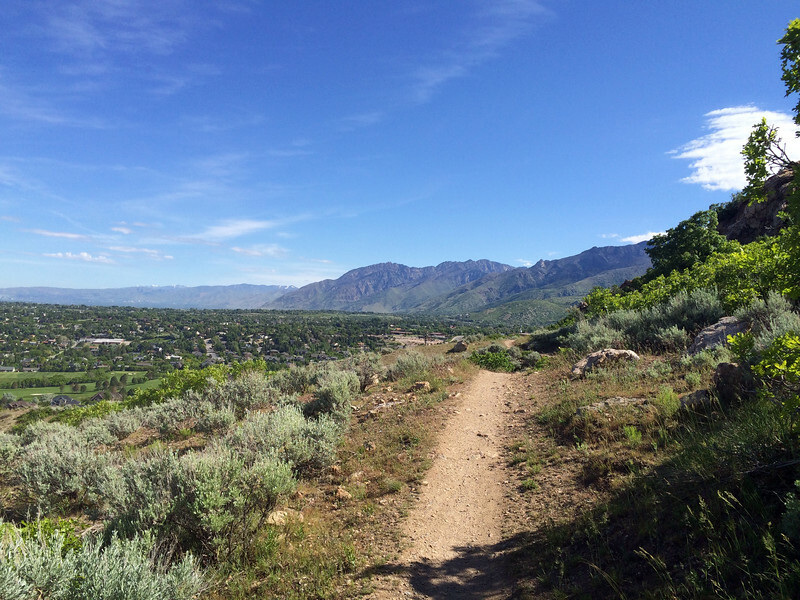 We rounded a small curve and saw a trailhead to hike up into Bear Canyon. I made a note to look online to find out more about Bear Canyon. One more curve and we were quite suddenly at the suspension bridge. It was bigger than I expected, but alas, I’d seen it from at least a couple of miles away. 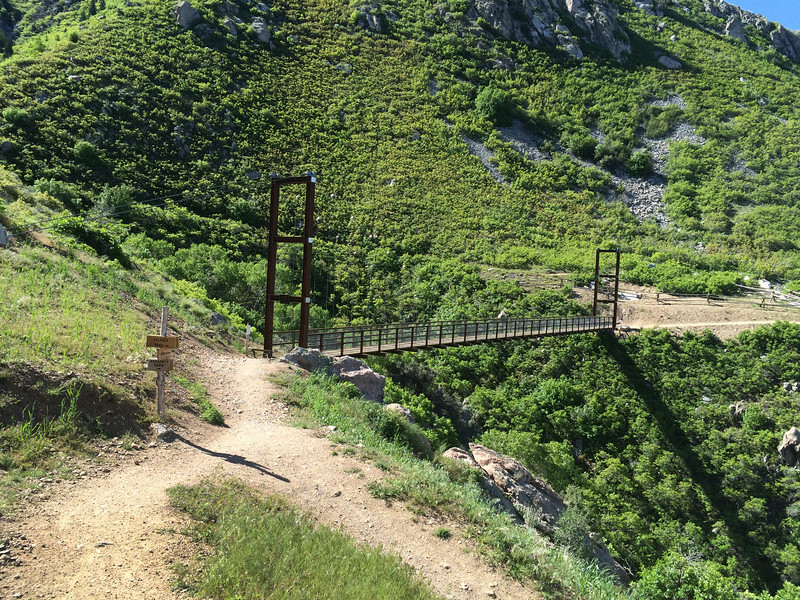 It spans 185 feet across Bear Canyon and was built solely for the Bonneville Shoreline Trail to divert hikers away from upper Bear Canyon, which is a watershed. Apparently hikers had a hard time reading the multiple “no dogs” signs. You can read more about the bridge and how it was built here. I had it in my head that I was going to walk across the bridge. I really was. It was a little windy and the bridge moved a bit with each step, as suspension bridges are designed to do. I’m not sure how high the bridge is, but the half-inch spaces between each wood slat allowed me to see all the way down to the rushing creek below and my acrophobia yelled “NOPE!” and I turned around. I might be able to walk across if I didn’t look down and walked really quickly… or if I ran. Matthew fell asleep when we were about ten minutes from the car, of course. It was a gorgeous day and the trail was a lot of fun. 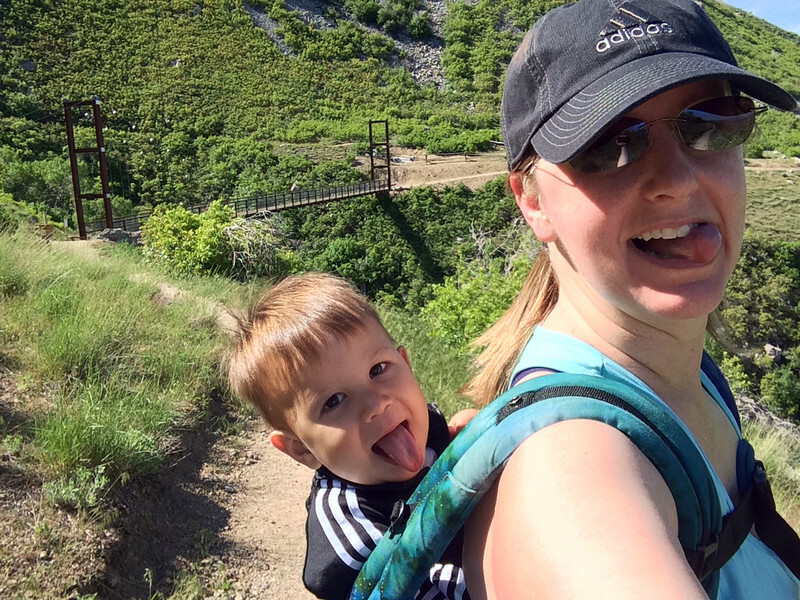 I’ll likely hike it again next week with my Hike it Baby crew. 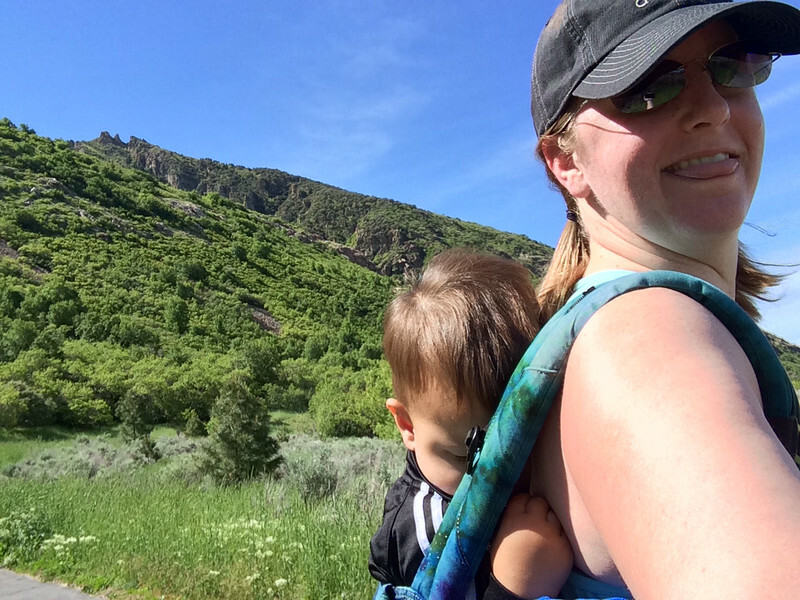 This entry was posted in 52 Hike Challenge, Utah and tagged 52 Hike Challenge, babywearing, bear canyon, bonneville shoreline trail, BST, draper, granite, hike it baby, hiking, lillebaby, LILLEbrity, LILLElove, suspension bridge, utah, wasatch mountains, watershed. Bookmark the permalink.